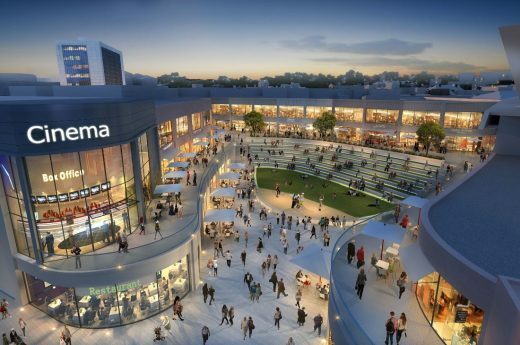 Planning Approval for this £75m mall extension: the project adds restaurants, cinema and sports centre. 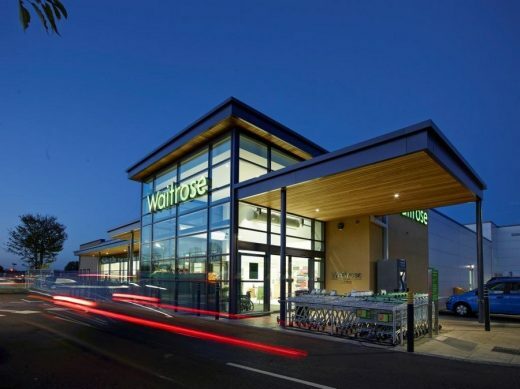 Award winning architects, Farrell & Clark’s new outlets for British supermarket chain Waitrose have recently opened in Bedford, Wootton and Oundle to great success. Planning applications for several more new local Waitrose stores across the country have also been submitted by the practice. This building design includes 81,000 sqft superstore and 71 residential units. The designs for the retail section of the development feature an undulating roof, which effectively ‘shrink wraps’ the volumes of the store to improve energy efficiency and help reduce running costs. The glazed east façade affords views into the market place inside the store and is protected from solar gain by the dynamic overhanging roof and vertical glass baffles.